The Canary Islands were formed as a result of intensive volcanic activity in the region, which many years ago led to the formation of deep gorges, vast valleys and rocky canyons. It is a perfect place for sailing all year long, irrespective of the season. The archipelago attracts with their fantastic volcanic and mountainous landscapes, stretches of dense, green forests, desert-like areas, abundant flora, fancy ports, as well as with hospitable people, who live and breathe with music and the carnival, cheap restaurants, kilometres of beaches, and its exceptional rum. Situated in the Atlantic Ocean near Africa, the Canary Islands form an archipelago of 13 islands, out of which 7 are inhabited: Gran Canaria, Lanzarote, La Gomera, Tenerife, La Palma, Hierro, and Fuerteventura. The archipelago is located in the subtropical zone, but thanks to the north-eastern trade wind, it has a mild climate. Islands’ inhabitants tend to call it “the Elysian wind”. The wind provides sailors with ideal conditions for sailing. Endless beaches of volcanic origin, surrounded by parks of palms and dragon trees, and the blue sky with the swoosh of surf only strengthens the exoticism of these wonderful islands. The Canary Islands, also known as “The Happy Islands”, are an ideal place for all-year-long leisure. 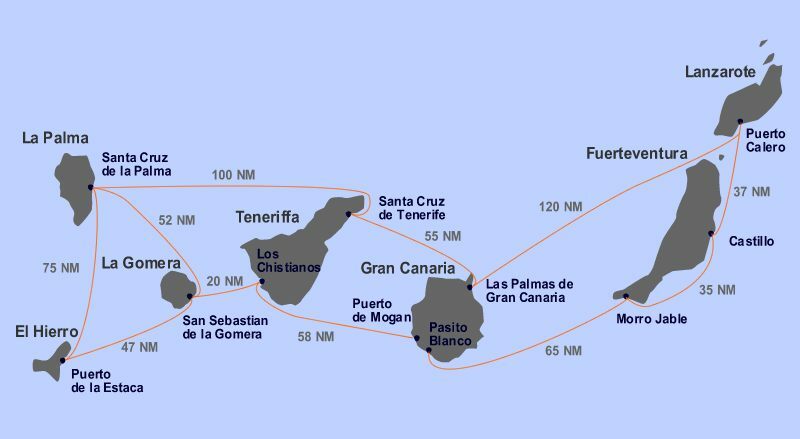 The cruise in the Canaries will surely be an unforgettable adventure and a source of invaluable memories. A perfectly prepared yacht and catamaran fleet and state-of-the-art service centres in marinas will surely add value to the time spent under the sails.